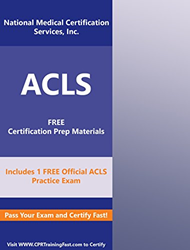 http://www.cprtrainingfast.com has just released it's Amazon Kindle version of BCLS, ACLS and PALS study guides complete with practice exams that parallel their site along with the answer key. Today, http://www.CPRTrainingFast.com announced it has published three eBooks on multiple platforms, including the Amazon Kindle marketplace. The eBooks are being sold for just one dollar. They are named The Advanced Cardiac Life Support (ACLS) Provider Study Guide, The Basic Cardiac Life Support (BCLS) Provider Study Guide, and The Pediatric Advanced Life Support (PALS) Provider Study Guide. Included are test preparation materials and a free practice exam, which should prepare customers to succeed on their exams and certify fast. This is an exciting new venture, as CPRTrainingFast recognizes that they must adapt to best prepare their customers for the changing medical professional landscape. In addition, they hope to expand their customer base to tech savvy medical professionals. Topics covered in the eBooks will help prepare doctors for their ACLS certification, BCLS certification, and PALS certification with a detailed guide to proper life support techniques. The free ACLS, BCLS, and PALS practice tests use real questions from previous exams, so the customer will be fully prepared to pass their ACLS online, BCLS online, and PALS online exams. This is a leap forward for http://www.CPRTrainingFast.com and they have every intention to continue publishing eBooks and practice exams to create a knowledgeable customer base. Upcoming topics include TLSA and NLSP online study guides and free practice tests.